One of the oldest and most celebrated domaines in Savennières. The most recent owners and caretakers of the land are Monsieur and Madame Luc Bizard. They own eleven hectares, nine of which are entirely dedicated to the cultivation of Pineau de la Loire, known today as Chenin Blanc. The domaine sits at the highest elevation in the appellation of Savennieres. This is a Chenin Blanc from the Anjou region in the Loire Valley. The soils here are rich, and the microclimate is ideal. 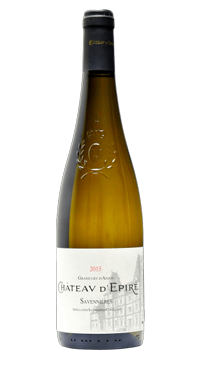 Southern and south-eastern sun exposure brings ripeness to the grapes, while the proximity to the Loire River keeps the temperatures moderate. The subsoils are comprised of sandstone and schist, and the top soil is a beautiful blue slatey schist that covers the vineyard floors, lending nerve and firmness. This is one of two cuvees produced by the estate. This is the more approachable one when young; it is dry with ample minerality, notes of exotic fruits and lots of complexity.